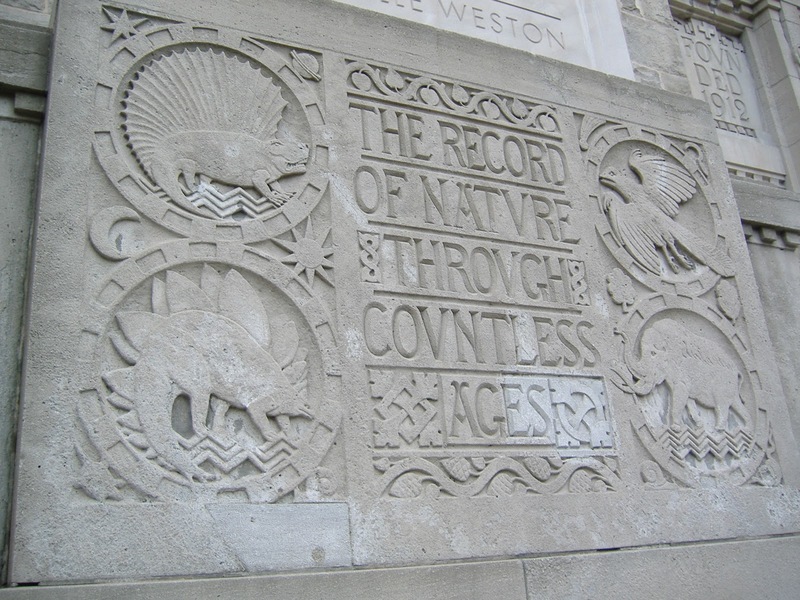 Now that I’ve talked about the ROM‘s current offerings of temporary special dinosaur exhibits, I thought I’d turn my attention to the permanent fossil galleries. 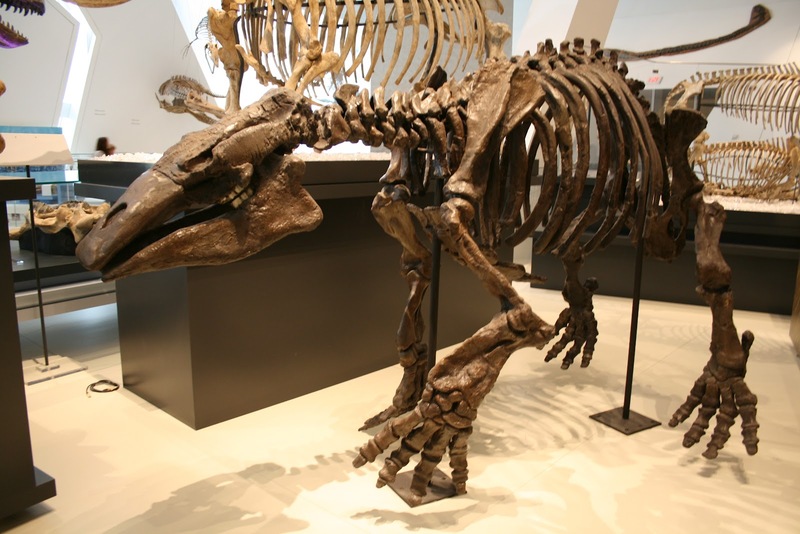 The ROM has long been one of my favourite museums, and as a student of palaeontology the only museum I have visited more often for my research is the Tyrrell. The last five years have seen some major renovations at the ROM, including the construction of the Michael Lee-Chin Crystal. The former entrance to the museum was grand and ornate and ushered you into the entrance hall known as the Rotunda, which featured a mosaic dome ceiling. 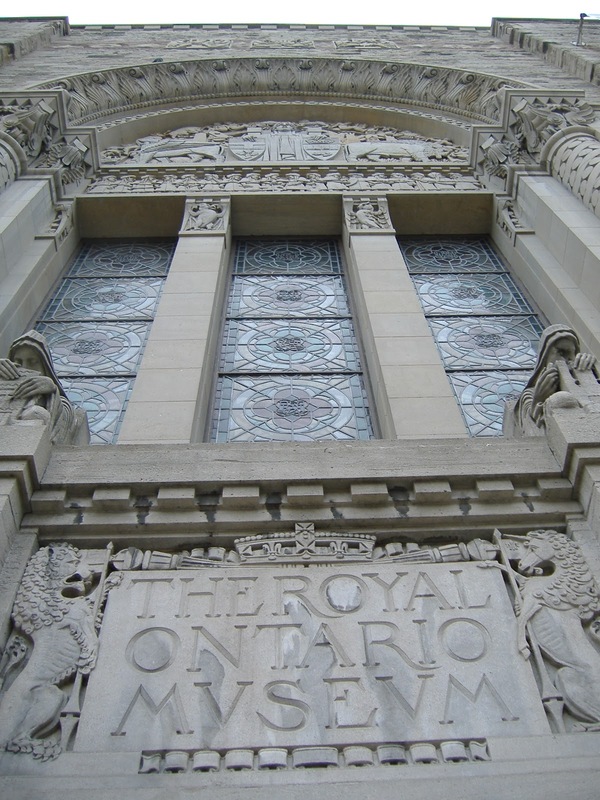 The last time I visited the ROM’s previous dinosaur galleries was in 2003, before I had a digital camera, so I’m afraid I don’t have any photos of the old exhibits. Although I was fond of the dinosaur skeletons in fake-foliage jungle setting, it was clear that the fossil halls were in need of updating to reflect current ideas in palaeontology. 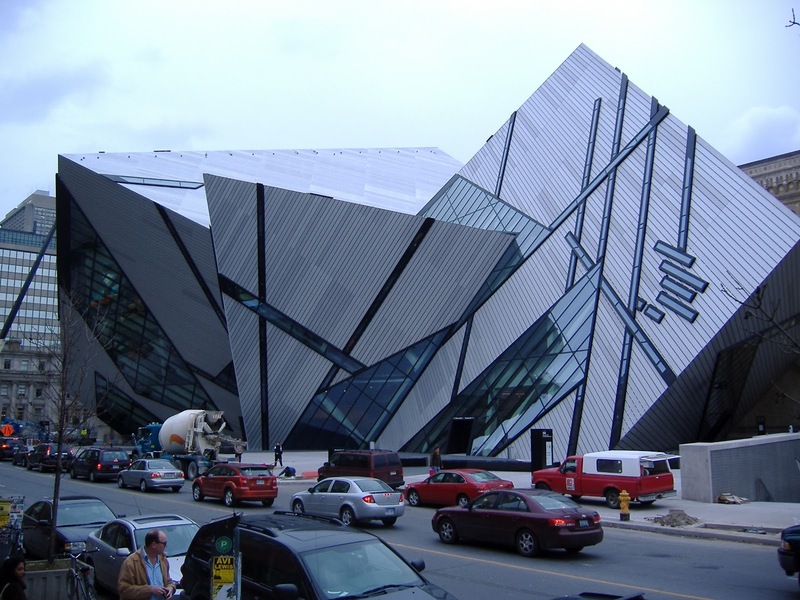 In 2007, the ROM opened a new addition to the museum, called the Michael Lee-Chin Crystal, which houses (among other things) the Mesozoic and Cenozoic fossil halls. Although at first I had mixed feelings about the crystal, I’ve come to really like the way it sprouts from the original museum building, and it certainly attracts attention. The most recent iteration of the dinosaur galleries are housed within the bright, white rooms of the crystal. 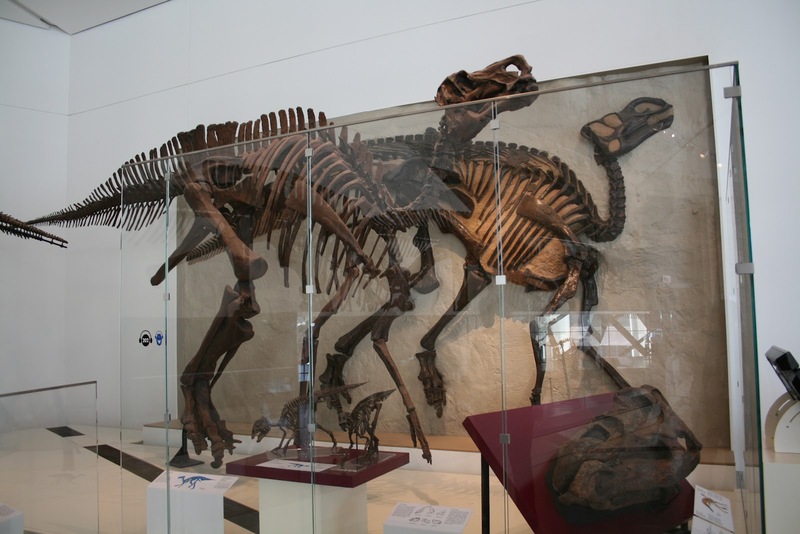 A lot of specimens are on display, in particular the ROM’s large collection of Cretaceous Albertan dinosaurs. The dinosaur exhibit does not overwhelm with a lot of text, but there is good information about each specimen (what’s cast, what’s real, etc.) provided nearby. 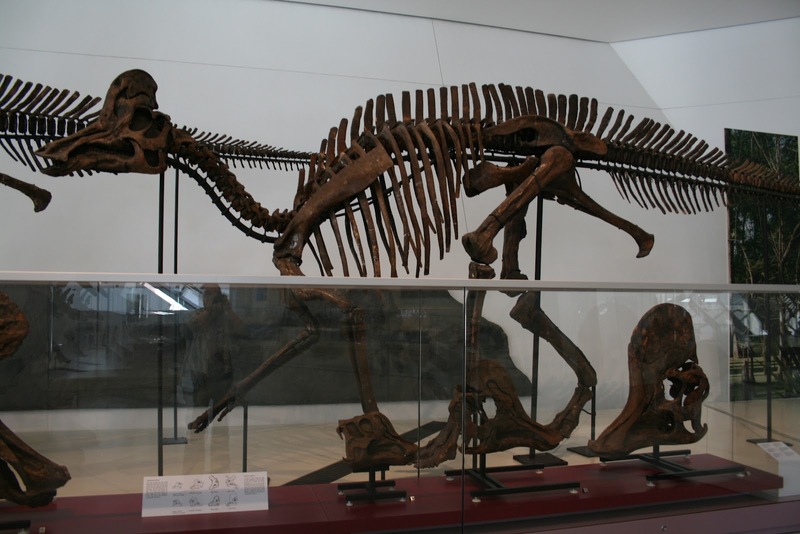 In particular, I like the display of ontogenetic changes in the hadrosaurs Corythosaurus (shown here) and Lambeosaurus. The ROM has one of the more extensive collections of ankylosaurid material, and a little bit is on display. 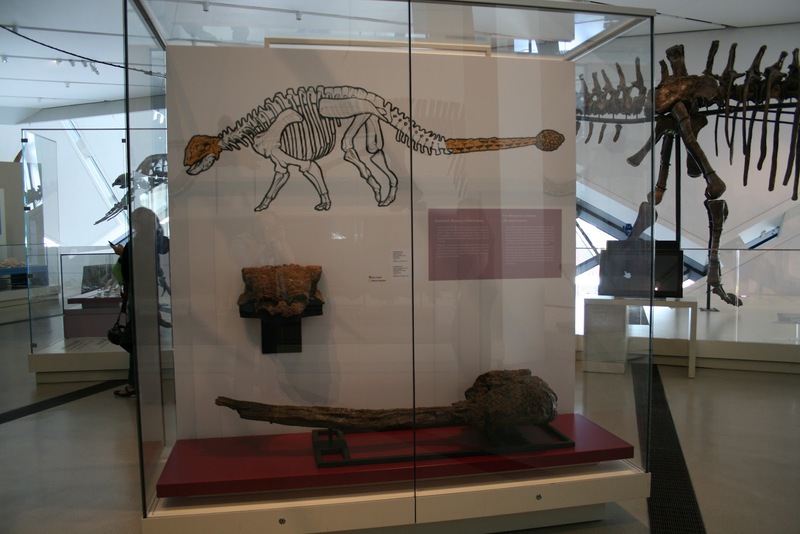 The skull on display is the very nice ROM 1930, and the tail club, ROM 788, at 59 cm wide, is the second largest tail club referred to Euoplocephalus. I CT scanned this club before it was put on display, for my research on ankylosaur tail club swinging and impacts, and it only just fit through the aperture of the scanner. The ROM also has a very nice collection of fossil mammals, including this really unusual Desmostylus…. 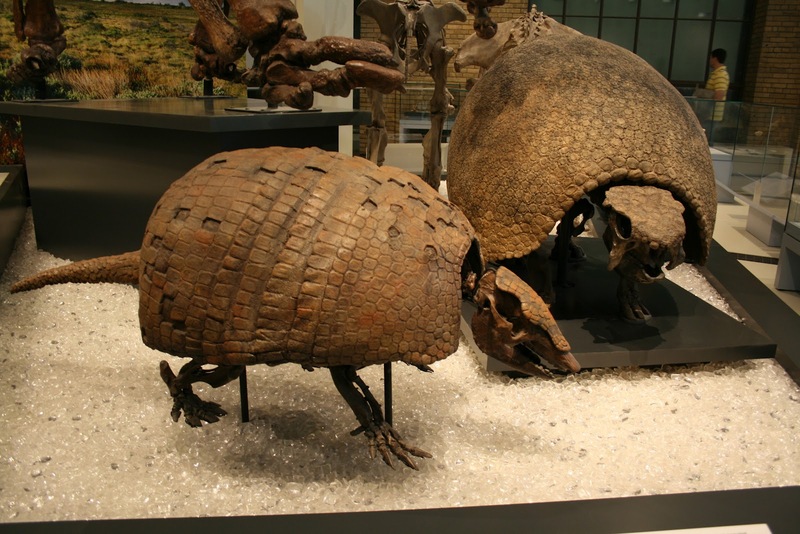 …and wonderful South American megafauna, like this giant armadillo (foreground) and glyptodont (towards the back). The giant armadillo and glyptodont are great.